Hello! Continuing my catch up of Barry M releases, today I have the four newest additions to the Molten Metal line to share with you. 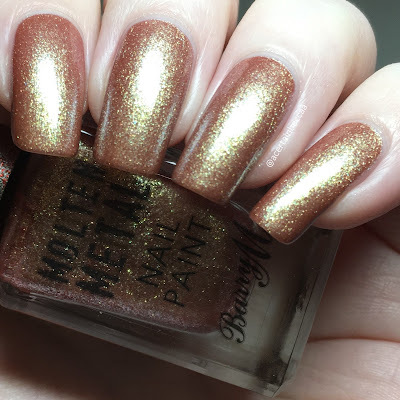 If you missed my recent swatch of the throwback crackle effect polish, you can find that here. The molten metals were released in January, and are all super sparkly. 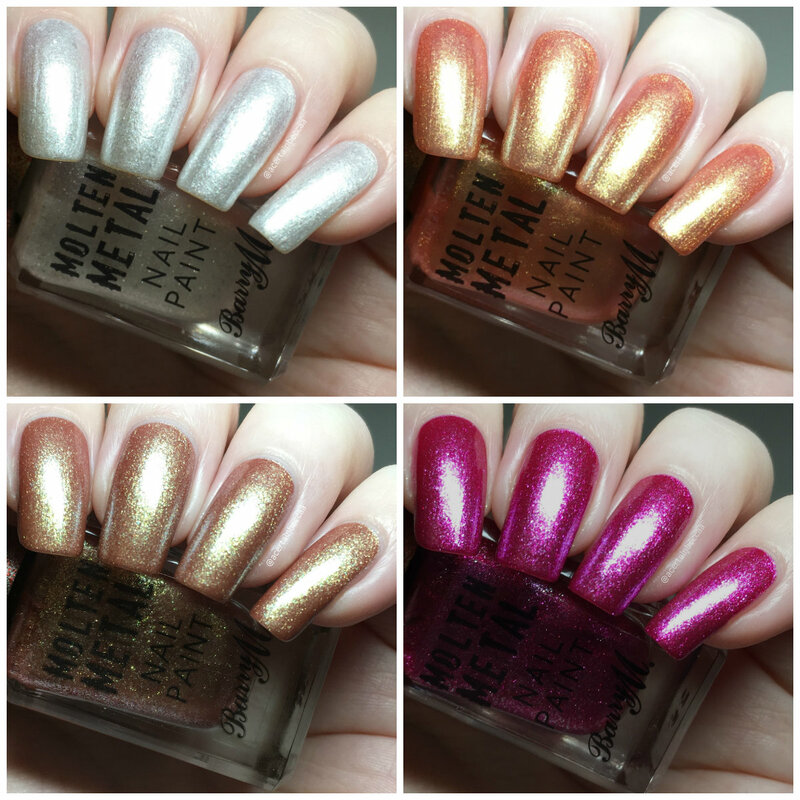 Read on for my full swatches and more info. 'Ice Queen' is a shimmery pearly white with small silver glitters. As is to be expected with such a delicate white polish, this does start off quite sheer. However, the formula is super smooth and easy to apply and it builds up to full opacity in three coats. Below is three coats with topcoat. 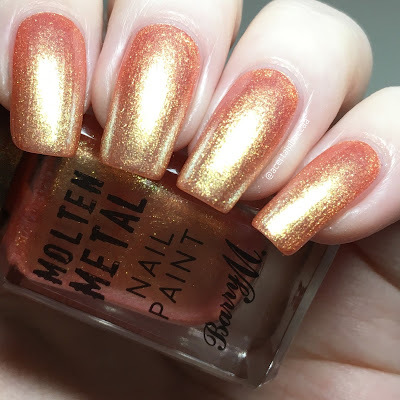 'Peachy Feels' is a soft peachy orange base packed full of gold shimmer. The formula is smooth and easy to apply. I could still see my nail line at certain angles after two coats, so added a third. Below is three coats with topcoat. 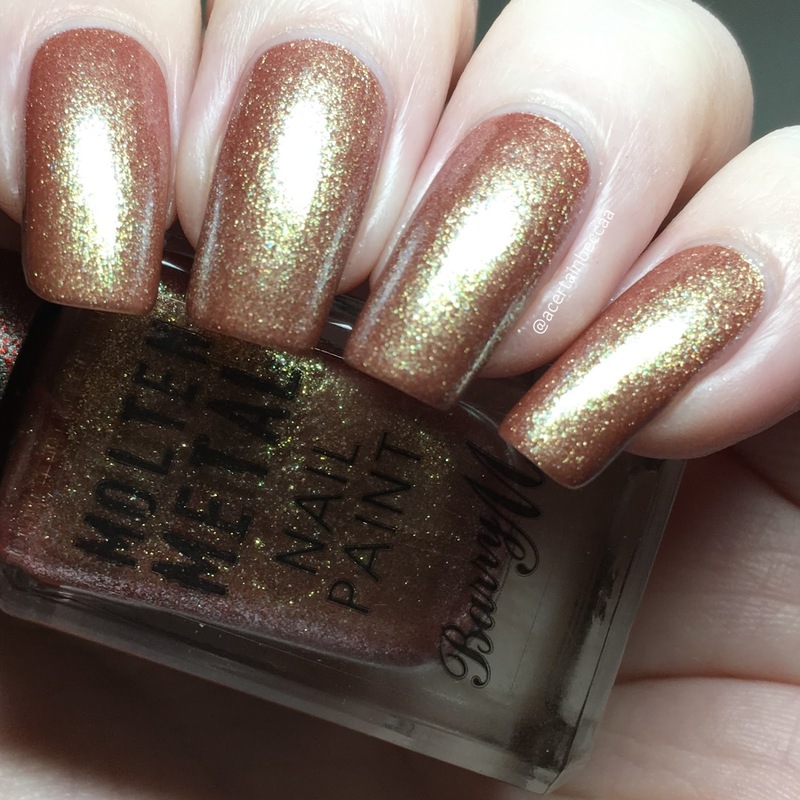 'Golden Hour' is a bronze base with a similar gold shimmer. Again the formula is lovely and smooth, and easy to apply. I found this one had slightly better coverage and was opaque for me in two coats. I feel like the shimmer in this leans green at some angles. Below is two coats with topcoat. 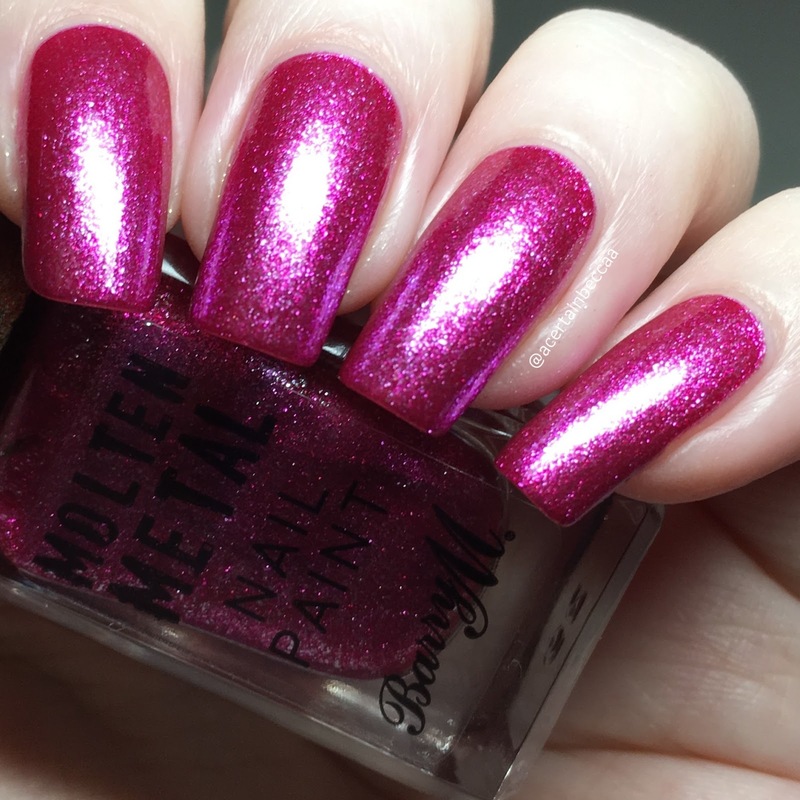 'Fuchsia Kiss' is a metallic fuchsia with little sparkles of silver. 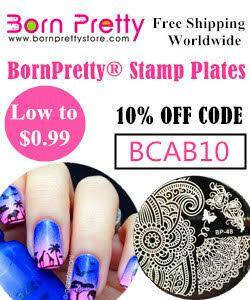 It has a smooth and easy to apply formula, and is the most opaque of the four polishes. I had fab coverage on the first coat, although I did need a second to even out some slightly lighter patches. Below is two coats with topcoat. What do you think? These all fit perfectly alongside the rest of the Molten Metal nail paints. I am finding it hard to pick a favourite though! I love the softness of 'Ice Queen', and 'Fuchsia Kiss' is completely my colour, but something about 'Peachy Feels' just calls to me - it's so unique and has a gorgeous glow to it. 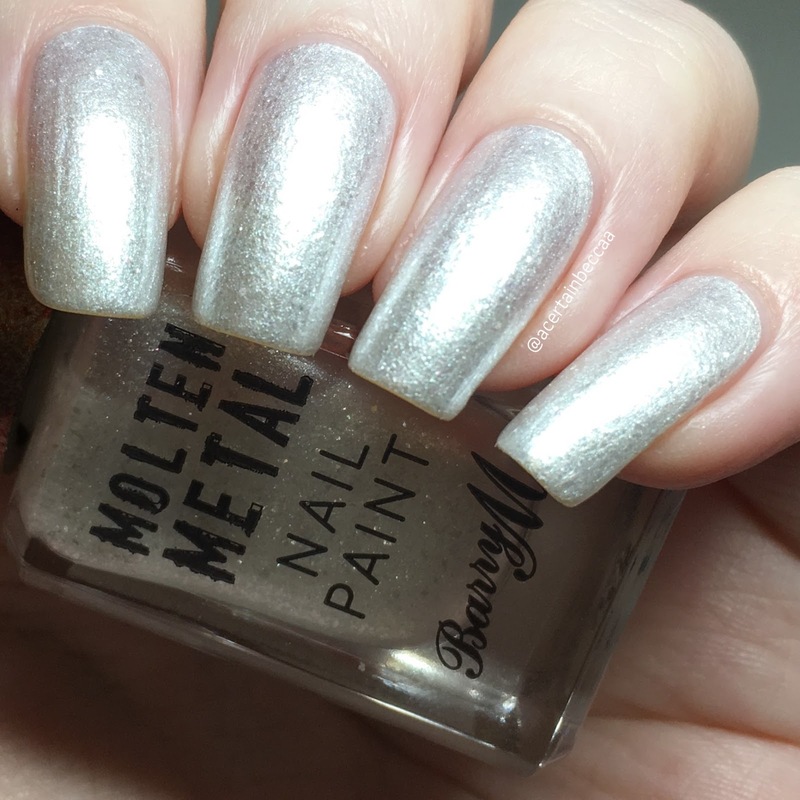 The polishes mentioned above are available now on the Barry M website here, the Superdrug website here, and the Boots website here.